The story of why I got an amputation is a long and complicated tale. Let me preface this to say that my story will be graphic at points and may disturb those that have any sort of a sense of empathy. I also need to define a couple of conditions that affected my outcome. First - Diabetes: I am a type II diabetic, since my diagnosis in 1994, I have taken it seriously with various degrees of sincerity throughout the last 20 years. My average hA1C was in the mid 6 ranges the first 10 years, with occasional spikes into the 7's and once even into the 8's. Each time I let it slip, I lost a little feeling in my left foot. It started out just being my little toes but then progressed into the ball of the foot. I would not get all the other symptoms of neuopathy, such as stabbing pains but I did have to check my feet every day. The day the accident occurred I was mowing the lawn. I was wearing a pair of Crocs and everything was good. I stepped around one of our landscaped beds and accidentally stepped on the green metal border. It was old and had a very sharp edge that cut through the shoe and deep into my foot along the outer edge of my foot. The cut went all the way to the bone and bled like a sieve. I got the bleeding stopped and went to the hospital where they told me that they couldn't sew it up because of the deep callouses on my foot. They cleaned it up and put steri strips on it. and in about a month it healed over. I wish that was the end of the story, but it isn't. In a week it really started to look bad. You see I contracted a little known (publicly) bacteria called MRSA. Methicillin-resistant Staphylococcus aureus. This bacteria claims more lives each year than AIDS, yet remains safely out of the public eye. You can learn more about it here. 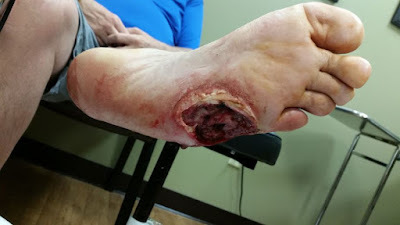 MRSA Survivors Network It became an osteomyelitis (bone infection) and slowly began to eat away at the bones of my foot. I became very ill and eventually it broke through the surface of my foot after a visit to the beach. 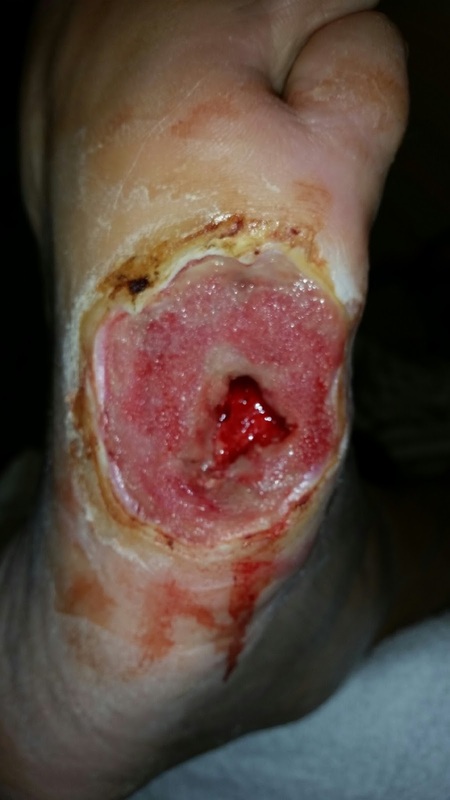 I went to our local wound care clinic and had the infection excised through surgical debriedment. To make a long story short, even with the care of a surgeon and an infectious disease doctor, and months of treatment we were only able to maintain a slim toehold (no pun intended) on the infection. Eventually the infection began to gain momentum and the amputation was truly the only course of action that would save my life. My amputation took place on March 11 of 2015. That will forever be my Ampu-versary. I spent three days at the hospital and was transferred to a rehab hospital for another 6 days, where I made their lives difficult by my desire to get back home. I have pushed my recovery just about as hard as I know how, and wish now that I had done the amputation when it was first suggested 9 months earlier. The main point of all of this back story is to let everyone know that this decision to amputate my leg was not an overnight decision. I had spent 9 months of rigorous treatment trying to save the leg from amputation. For me, the thought of actually losing my leg was a sign of failure, either on the part of body or my self-control over my diet and exercise. I thought only of how it would affect my life and for me that seemed like the end of the world. Looking back at it from where I am now, a little over 4 months post operation, the paradigm that I had was much worse than the reality. bones in my foot. This wound never healed.